A typical application of Castell Key KS20 Switch (model : KS20-FSB-P-CC4) is machine guarding. It is usually used in combination with an Access Interlock such as the Salus for part body access or an Access Interlock with an exchange key for full body access control. The Castell Key KS20-FSS Switch breaks the machine safety circuit, ensuring a machine is shut down when the key is turned and removed. 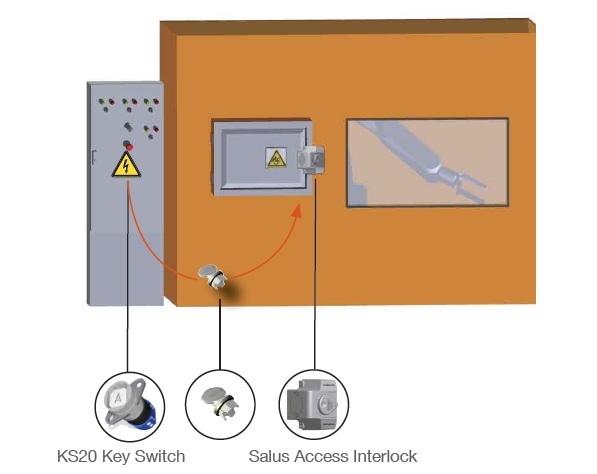 The key can then be taken to the Salus Automatic Access Interlock to enable access to the machine. The machine cannot be restarted until the door is closed, the bolt is trapped in the Access Interlock and the key is removed and taken to the Castell KS Key Switch. Application : A typical application of Castell Trapped Key Interlock AI by Castell .. Application: A typical application of Castell Trapped Key AIE dual key AccessInterlock &nb.. Application:Castell trapped Key Interlock DAE ( DAE-FSB-30 ) which is a mechanical time delay unit i.. Application:A typical application of Castell Trapped Key Interlock KSE powersafe electrical switch i.. Application : A typical application of Castell Trapped Key Interlock AI is machine ..